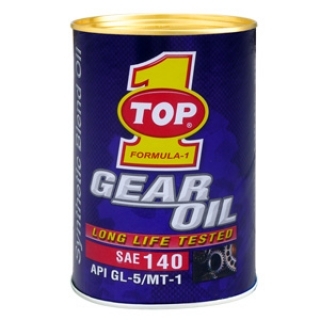 TOP 1 GEAR OIL HD 140 is a synthetic heavy duty, extreme pressure, automotive gear lubricant. It is manufactured from high quality synthetic base stocks and a superb additive package which imparts excellent thermal and oxidation stability, high viscosity index, and excellent shear stability. Lower frictional losses in the lubricant film and reduced churning losses due to lower oil bulk viscosity lead to reduced operating temperatures when compared to conventional gear lubricants. Required for many European automobile models, this lubricant is well suited for areas where low temperature start-ups may be encountered. Recommended for differentials and conventional transmissions in passenger cars and trucks where GL-5 fluids are specified.